Dr Emma Heywood has co-moderated a discussion taking place to accompany the annual meeting of the UN Commission on the Status of Women in New York. The event last month brought together six expert commentators from academia and the media to consider the question "Does the online space allow women in media to challenge stereotyping and misrepresentation?" Panel members were asked to discuss the successes they have achieved and the challenges they have faced in their efforts to develop an online presence. Emma was invited to take part in her capacity as Lecturer in Journalism, Politics and Communication at the University of Sheffield and leader of the FemmePowermentAfrique project, assessing the impact of radio on women's empowerment in Africa. As the debate got under way, it was the division between the online space and traditional media such as radio, Emma explained, that generated some of the most interesting aspects of discussion. "UN representatives were emphasising that rural women have to be taken into account," she said. "It's all very well saying online space is the place for women to progress their thoughts, but in fact if you haven't got internet, you haven't got the money to buy a phone, you haven't got electricity, then you'll never be able to use this online space, so it's irrelevant. "They were fighting the cause for rural women, illiterate women, marginalised groups. I thought everyone would be in favour of the online space, but a lot of them recognised that there is a need for traditional media." The prominent role of radio in developing countries is central to Emma's research with FemmePowermentAfrique: "Radio is the dominant source of information, and mostly it's a source that provides independent information. Everyone listens to the radio." FemmePowermentAfrique's sponsor Fondation Hirondelle was one of several NGOs involved in staging the event alongside the Global Forum for Media Development. Caroline Vuillemin, the General Director of Fondation Hirondelle, accompanied Emma on the visit. 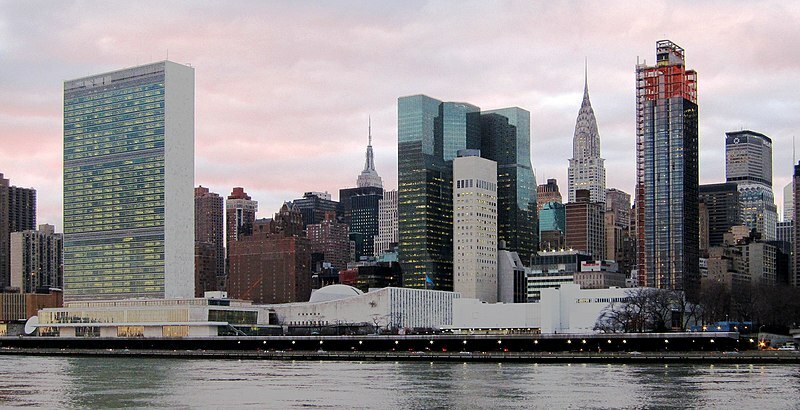 The discussion took place on 21 March at the United Nations Plaza in Manhattan and was very well attended, says Emma, who is also course leader on the University of Sheffield's Global Journalism MA. "It was full. It was supposed to hold 80 or 90 but there were people standing and sitting on the floor, which is unusual for a conference. It shows the importance of women getting their voices heard!" Taking part in the event will also mean greater reach for the work of FemmePowermentAfrique, according to Emma, who says: "I met people from other NGOs who are interested in Niger, which is now the least developed country in the world. They're interested in the impact of our research project and want to follow up on that."